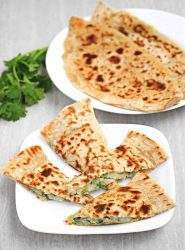 Boulanee Katchalu | Afghani Bolani is a potato stuffed Vegan Flatbread from Afghanistan. In a wide bowl, measure the flour and add the salt and oil. Add just enough to bring the flour together and make a soft dough. Knead for about 5 to 7 minutes and then let the dough rest (covered) for at least 30 minutes. Cook the potatoes in boiling water until it is cooked through. Insert a knife or a skewer inside the potato and check to see of it is done. Drain the potatoes and let it cool. Peel the potatoes and mash them using a fork. Add the rest of the ingredients mentioned under the filling. Mix it well and leave it aside. Divide the dough into 8 pieces. Dust the rolling pin and dough ball with flour and roll it into a thin 10 to 12 inch circle. Spread about 3 TBSP of filling on one half of the dough. Leave a little space at the edge to help seal the flatbread. Fold the dough over the filling and seal the edges. Make sure to remove any excess air inside the pocket and seal. Heat a heavy griddle/pan over medium heat. I love using my cast iron pan for cooking the Bolani. Add about a TBSP of oil on the griddle and spread it around. Place the shaped flatbread and cook on both sides until golden brown. Add more oil if needed. Place the cooked Bolani between kitchen towel to keep them warm. Repeat with the rest of the dough and serve warm.